Currant Jelly. Mrs Cuitt Gather the currants when full ripe strip them off the stalks into an earthen vessel. 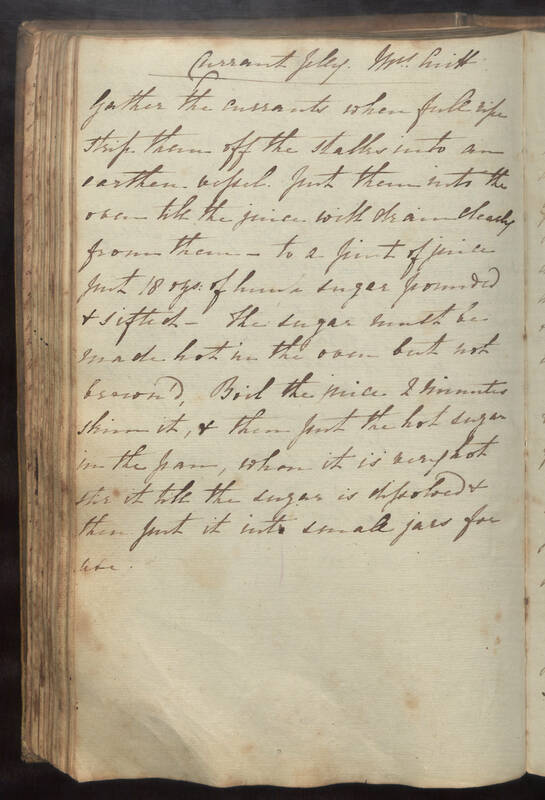 put them into the oven till the juice will drain clearly from them - to a pint of juice put 18 ozs: of loaf sugar pounded & sifted - The sugar must be made hot in the oven but not brown'd, Boil the juice 2 minutes skim it, & then put the hot sugar in the pan, when it is very hot stir it till the sugar is dissolved & then put it into small jars for use.